Update 2 (By Corey Foster): Anker’s latest RoboVac, the 11S, ascends to the throne with a lower price, shorter stance, greater suction, and whisper quiet operation. The eufy RoboVac 11S truly impresses feature after feature. Upping its predecessor on several fronts, the greatest feat of the 11S is jumping from 1000Pa to a massive 1300Pa of suction (the original RoboVac 10 only managed 400, for context) with a new height of just 2.85 inches, down from over 3". It adjusts cleaning power from hard surface to carpet, and runs for up to 100 minutes on a charge. I consistently clocked 90 minutes of actual runtime across my home’s mixture of hardwood and carpet. The RoboVac 11S does all of this quietly- so quietly that my cats stalk it instead of hiding, and it doesn’t distract me from my work or interrupt my conversations. A few years ago, our household tried two Botvacs only to send each back within a week. One wouldn’t consistently dock and the other ran only until it wedged itself under our couch. But the RoboVac 11S has been successfully vacuuming floors for two weeks, while successfully navigating the underside of furniture. Update: Since this was originally posted, Anker has replaced the RoboVac 11 the RoboVac 11+, which is more powerful than the original RoboVac, and has all of the same features. I’ve been a happy Roomba 770 owner for over a year now, and will continue to be until it dies, but if I were buying a robotic vacuum today, I’d get the Eufy RoboVac 11 instead. 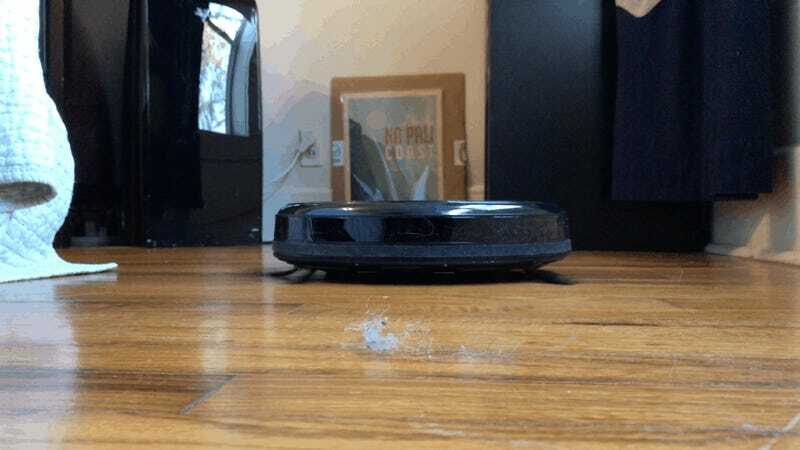 Having tested out the RoboVac for a few days, it’s basically just as good as my Roomba. In fact, it does some things better: It’s a little thinner to fit under more pieces of furniture, it includes two side brushes instead of one, and it has a much better remote. But the biggest difference is how quiet it is; this thing is a ninja compared to the Roomba. I recorded both from the same distance with the same microphone in the same room, and compared them side by side in this video. It’s not a scientific test by any means, but I didn’t do any post-processing or volume adjustments to the audio, it’s all straight from the mic. On the other hand, the RoboVac doesn’t have a carrying handle like the Roomba, it seems to get stuck a little more often, and it doesn’t come with a virtual wall to keep it away from certain parts of your home. These downsides are real, but in my opinion, they don’t cancel out the RoboVac’s advantages, and they really don’t justify its price difference. Both products are exactly what you’d expect mid-priced robotic vacuums to be. Neither is perfect, but they both do a pretty decent job of bopping around your house once per day to keep your floors clean, so why pay more than necessary?